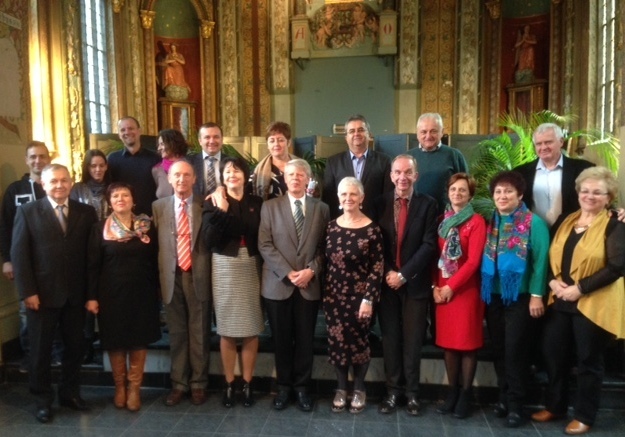 On October 21 the University delegation headed by Rector Professor Nadia Skotna, consisting of the Dean of Department of Social Studies and Humanities Ihor Hrynyk and the Dean of Department of Biology and Natural Sciences Svitlana Voloshanska, took part in celebrations dedicated to long-standing activity of our partner – NGO “Oradea” (Lier, Belgium), headed by an honorary doctor of Ivan Franko Pedagogical University in Drohobych, Patrick Bellinck. The ceremony took place at the City Hall of Lier, where the city government and visitors congratulated the organization, noting the significant contribution of its management and staff in the establishment and implementation of numerous social projects in Romania and Ukraine. The cooperation with our university envisages organization of workshops for students and social workers of Lviv Region, joint conferences and round table talks, development programs of student and teaching mobility. The results of Belgian and Ukrainian partnership were highly appreciated by the Embassy of Ukraine in the Kingdom of Belgium, which was represented by the 2nd secretary Natalya Holyan. Our colleagues had a very pleasant and warm meeting with the students of Department of Social Studies and Humanities who currently are studying at the University College Vives under Erasmus + program. Dr. Bellinck presented a gift to the participants – a concert of a symphony orchestra from Slovakia conducted by Hermann Engels from Belgium.